Lemak Lodeh is perfect for family gathering, a dish popularly eaten on festive occasions like Hari Raya. This dish is essentially rice cakes (lontong) soaked in thick curried vegetable gravy. This recipe was taken from the New Paper on Sunday 12th August 2012. Recipe shared by Hedy Khoo; family recipe by Madam Zubaidah Mahamood, 60, housewife. Check out the Other version of Lodeh. Grind the chillies, onions, clove and belacan to get a chilli paste. Mix tamarind with water. Strain and reserve. Heat oil over low heat. Fry the chilli paste for about 20 minutes until fragrant or until the oil surfaces. over low heat. Fry spice paste until fragrant. Add the coconut milk, glass noodles and the vegetables. For Lontong, pls refer to this section. Or you can buy a packet of pre-packed uncooked rice such as "Adabi brand". Follow packet instrutions. To serve, put the cut rice cake on a plate and pour the curried vegetable gravy over it. Serve with sambal tumis on the side. thank you for this lodeh recipe. going to try this dish. 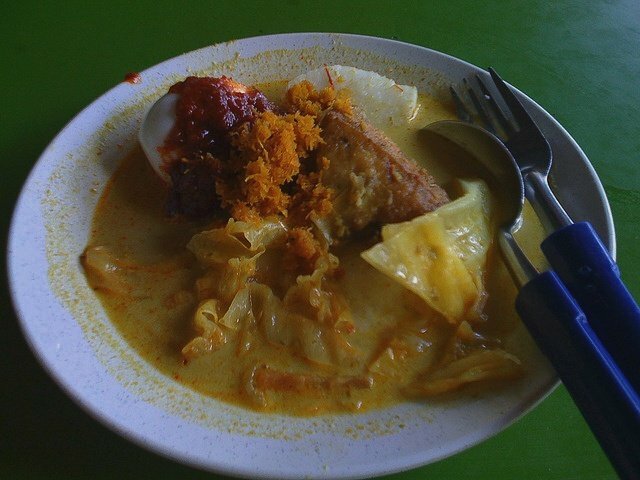 i realy love lontong lodeh. very tasty dish, good to go for breakfast. I made this lodeh exactly as called for and the flavor was not quite what I was expected. It was fantastic! are you sure or not Christina..so nice meh?